I was cleaning out TicTac the other day and came across this ball of yarn I made from all my scarp yarn. I decided I was going to make beanies out of it since beanies seem to be my thing this year. I have made 30 beanies so far this year. I sell them to help fund my travels. $20 a beanie. They are youth or adult sizes. 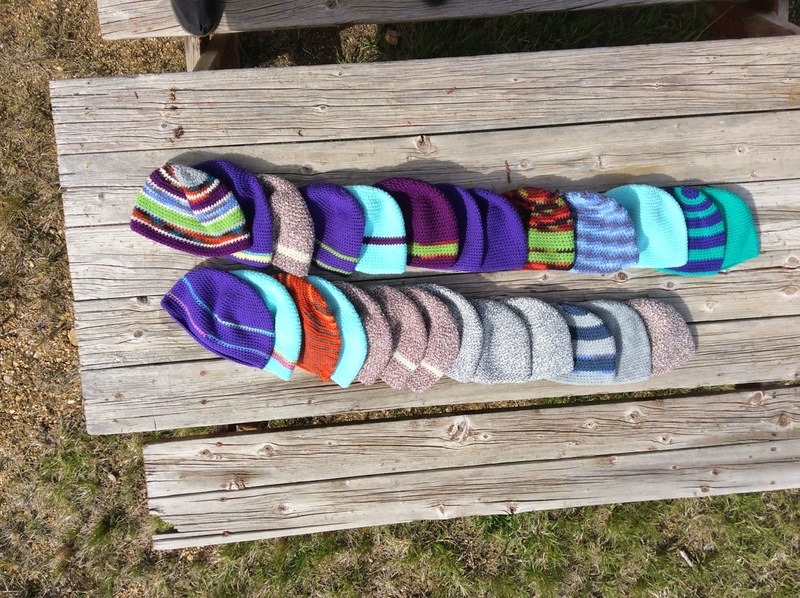 Beanies left from my 30 beanies I have made so far this year. I decided with the ball of yarn I found I am going to create a guessing game. Guess how many adult beanies I can make with this ball of yarn. To play... like my FB page at facebook.com/journeytoworthy and take your guess by posting your guess on this picture. The first correct answer will get a free beanie from the beanies I make with this ball of yarn. I really have no idea how many beanies it will make but they will all use the same pattern. To help you with your guess I have made 2 beanies already. This should occupy me for a few days at least and might be quite fun. Guess away and Good Luck! how would we buy a beanie?